The four main groups of hip muscles are gluteal, adductor, iliopsoas, and lateral rotator, defined by the type of movement they mediate. The gluteus maximus extends the hip, while the gluteus medius and minimus are involved in hip rotation and abduction (moving hip out from the midline). The adductor group (adductor brevis, longus, and magnus along with petineus and gracilis) moves the femur towards the midline from an abducted position. The iliopsoas group of muscles (iliacus and psoas major) is responsible for hip flexion. The lateral rotator group of muscles (externus and internus obturators, the piriformis, the superior and inferior gemelli, and the quadratus femoris) turns the anterior surface of the femur outward. This motion is aided by the gluteus maximus and the adductor magnus. adductor group: The adductor brevis, adductor longus, adductor magnus, pectineus, and gracilis. lateral rotator group: The externus and internus obturators, the piriformis, the superior and inferior gemelli, and the quadratus femoris. gluteal group: The gluteus maximus, gluteus medius, gluteus minimus, and tensor fasciae latae. iliopsoas group: The iliacus and psoas major. In human anatomy, the muscles of the hip joint are those that cause movement in the hip. Hip joint muscles are divided into four groups according to their orientation and function. Movement at the hip is similar to that of the shoulder joint, but due to increased weight-bearing requirements the range of potential movements is reduced. Key muscles of the hip: The gluteus maximus can be seen at the top, cut away to expose the underlying muscles. Muscles in the gluteal group are superficially located and act mainly to abduct and extend the thigh at the hip. Gluteus Maximus: The gluteus maximus is the largest of the gluteal muscles and gives structure to the buttocks. Attachments: Originates from the posterior of the pelvis and coccyx (tailbone) and attaches to the femur. Actions: Extends of the thigh and assists with rotation. Is only used when the generation of force is required (e.g. when climbing). Gluteus Medius: The fan-shaped gluteus medius muscle lies between the gluteus maximus and minimus and performs a similar function to the gluteus minimus. Attachments: Originates from the posterior of the pelvis and attaches to the femur. Actions: Abducts and medially rotates the thigh and fixes the pelvis during walking. Gluteus Minimus: The gluteus minimus is the deepest and smallest of the superficial gluteal muscles and performs a similar function to the gluteus medius. Attachments: Originates from the pelvis and attaches to the femur. The muscles of the lateral rotator group are deeply located and as the name suggests, act to laterally rotate the thigh at the hip. All of the lateral rotator group muscles originate from the pelvis and attach to the femur. Piriformis: The piriformis is the most superior of the lateral rotator group muscles. Actions: Lateral rotation and abduction of the thigh at the hip. Obturator Internus: The obturator internus lines the internal wall of the pelvis. Gemelli: The gemelli are two (superior and inferior) narrow and triangular muscles, separated by the obturator internus tendon. Quadratus Femoris: The quadratus femoris is a flat, square-shaped muscle (actually composed of four distinct muscles). It is the most inferior of the lateral rotator group muscles, located below the gemelli and obturator internus. Actions: Lateral rotation of the thigh at the hip, plays a major role in extension of the lower leg at the knee as well. (a) Adductor Group Muscles and (b) Key muscles associated with movement at the hip: The deep-lying adductor group muscles originate from the pubis and attach to the length of the femur. The iliacus and psoas major comprise the iliopsoas group and can be seen at the pelvis and lower spine. The five muscles of the adductor group are responsible for the adduction of the thigh, although several have additional functions. Adductor Longus: The adductor longus is a large, flat muscle covering the adductor magnus and adductor brevis. Attachments: Originates from the pubis and broadly attaches to the femur. Actions: Adduction and medial rotation of the thigh. Adductor Magnus: The adductor magnus is the largest and most posterior of the adductor group muscles. Attachments: Originates from the pubis and attaches to the femur. Actions: Adducts, flexes, and extends the thigh. Adductor Brevis: The adductor brevis is a short muscle lying underneath the adductor longus. Actions: Adduction of the thigh. Obturator Externus: This is one of the smaller muscles of the medial thigh, and it is located most superiorly. Actions: Laterally rotates the thigh. 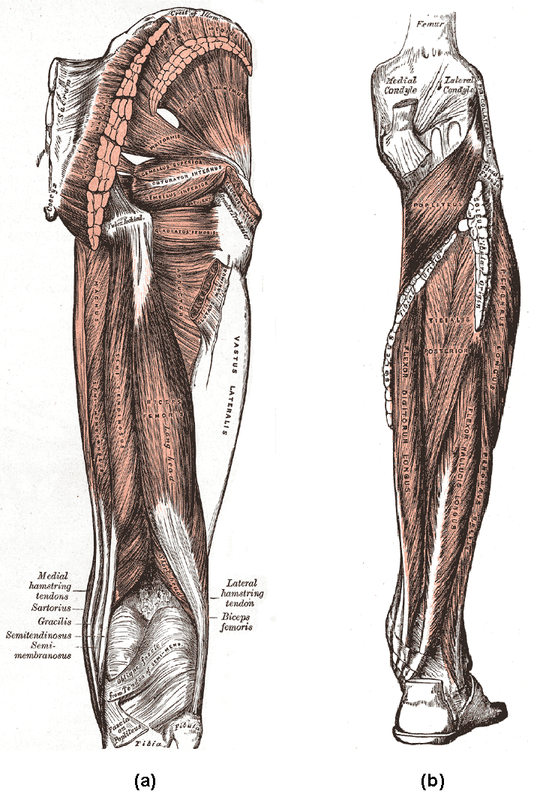 Gracilis: The gracilis is the most superficial and medial of the adductor group muscles. Crossing both the hip and knee joints, it can induce movement at both the hip and knee. Attachments: Originates from the pubis and attaches to the tibia. Actions: Adduction of the thigh at the hip, and flexing of the thigh at the knee. There are several other muscles that induce movement around the hip joint. Psoas Major: The psoas major is located deep in the back near the midline immediately adjacent to the spine. The iliacus and psoas major comprise the iliopsoas group. Attachments: Originates from the base of the spine, combining with the iliacus to attach to the femur. Actions: Flexing of the thigh at the hip joint. Iliacus: The iliacus muscle is a large, fan-shaped muscle which lines the interior of the pelvis. The iliacus and psoas major comprise the iliopsoas group. Attachments: Originates from the pelvis and the base of the spine, combining with the psoas major to attach to the femur. Sartorius: The sartorius is a long thin muscle in the thigh, the longest muscle in the body. Attachments: Originates from the pelvis and attaches to the tibia. Actions: Flexing, abducting and rotation of the thigh at the hip joint. Pectineus: The pectineus muscle is a large flat muscle found in the thigh. Actions: Adduction and flexing at the thigh at the hip joint. Biceps Femoris: A similar muscle to the biceps brachii in the upper arm, also double-headed. Two synergistic muscles are associated with the biceps femoris, the semitendinosus, and the semimembranosus. Attachments: Originates from the pelvis and femur and attaches to the fibula. Actions: Extends and laterally rotates at the hip. The main action is flexing of the lower leg at the knee. Extension (bringing thigh behind body) Produced by the gluteus maximus, adductor magnus, and biceps femoris. Flexion (extending thigh to front of body): Produced by the gracilis, psoas major, iliacus, and pectineus. Abduction (moving thigh laterally away from pelvis): Produced by the gluteus medius and minimus, obturator externus, gemelli, and sartorius. Adduction (returning thigh to midline): Produced by the adductor group of muscles. Rotation (rotation of the thigh around the hip joint): Produced by the lateral rotator group of muscles and the biceps femoris, sartorius, and gluteus medius and minimus. Three sets of muscles (popliteus, quadriceps and hamstrings) allow for movement, balance, and stability at the knee joint. At full extension, the tibia and femur “lock” into position, providing stability in the leg and improving load-bearing capacity. The popliteus muscle at the back of the leg unlocks the knee by rotating the femur on the tibia, allowing flexion of the joint. The quadriceps femoris muscle group (rectus femoris, vastus lateralis, vastus medius, and vastus intermedius) crosses the knee via the patella and acts to extend the leg. The hamstring group muscles (semitendinosus, semimembranosus, and biceps femoris) flex the knee and extend the hip. hamstring group: A group of three muscles found in the posterior region of the thigh, responsible for flexing of the lower leg at the knee. quadriceps femoris: A group of four muscles found in the anterior region of the thigh, responsible for extension of the lower leg at the knee. popliteus: A muscles located behind the knee which “unlocks” the fully extended knee joint allowing for flexion. The knee joint allows for movement of the lower leg relative to the thigh across the knee joint. The knee joint is in fact comprised of two joints: the tibiofemoral joint between the femur and tibia, which is the weight-bearing knee joint, and the patellofemoral joint, which joins the patella (kneecap) with the femur. The tibiofemoral joint is relatively weak and easily damaged, so it relies on muscles and ligaments to ensure stability. When the knee is fully extended the femur rotates slightly on the tibia to lock the joint into place, allowing for efficient load bearing. The patella is the attachment point for the quadriceps femoris muscle and is the attached by a ligament to the tibia. This increases the leverage afforded to the quadriceps femoris muscle, thus increasing its efficiency when extending the lower leg. The patella additionally protects the knee joint from damage. The patellofemoral has two key functions: increasing leverage of the quadriceps tendon to improve muscle stability and protecting the knee joint from damage. Muscles that generate movement across the knee are mainly located in the thigh and can be split into anterior and posterior compartments. The popliteus muscle, located in the lower leg, is responsible for “unlocking” the knee joint after extension. 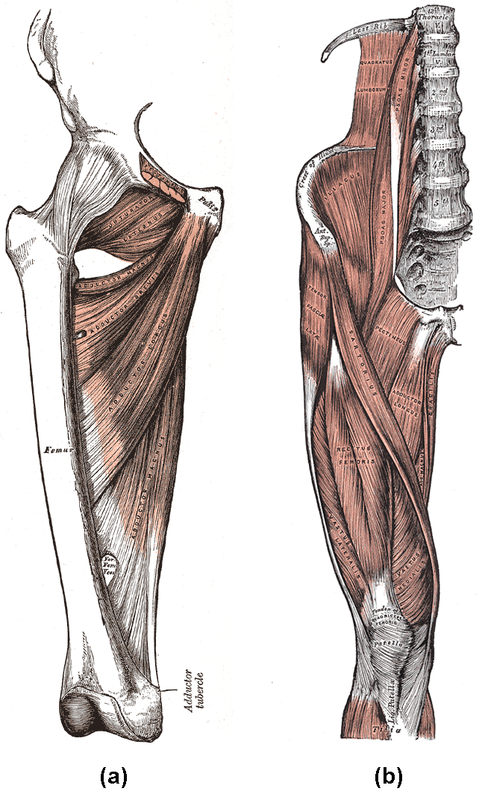 (a) Posterior muscles of the thigh and (b) posterior region of the lower leg: The biceps femoris and synergistic semitendinosus and the semimembranosus muscles are responsible for flexing of the lower leg at the knee. 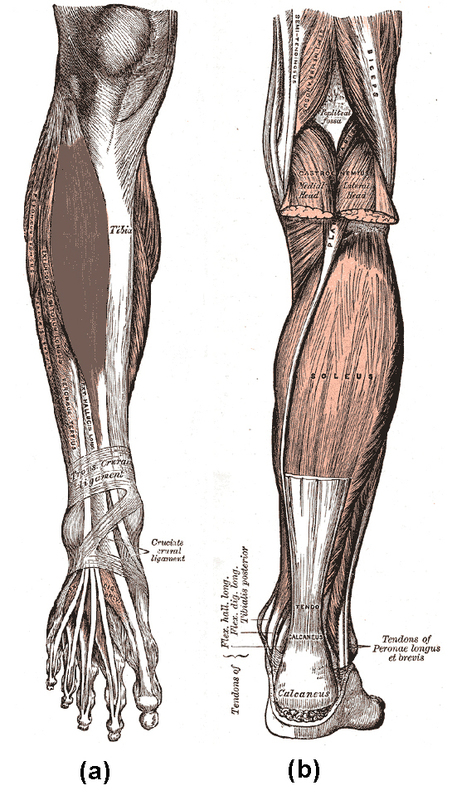 Posterior view of muscles of the lower leg, the popliteus can be seen at the top located behind the knee. There are four muscles in anterior region of the thigh. The pectineus and iliopsoas muscles are responsible for movement at the hip and are discussed elsewhere. Sartorius: The sartorius, a thin muscle in the thigh, the is the body’s longest muscle. Actions: Flexing of the lower leg at the knee joint. Quadriceps Femoris: The quadriceps femoris is actually composed of four muscles that comprise the front of the thigh: three deep-lying vastus muscles (lateralis, intermedius, and medialis) and the rectus femoris which covers them. All four muscles are the key extensors of the lower leg at the knee joint and also stabilize and protect the patella. Attachments: The vastus lateralis, intermedius, and medialis originate from the femur and attach to the patella. The rectus femoris originates from the pelvis and attaches to the patella. Actions: Extends the lower leg at the knee joint and stabilizes the patella. The rectus femoris additionally facilitates rotation at the hip. There are three muscles in the posterior compartment of the thigh: the biceps femoris and two synergistic muscles (the semitendinosus and semimembranosus). These muscles are sometimes termed the hamstring group. The posterior region of the thigh displays similarity with the anterior region of the upper arm in both structure and function. Biceps Femoris: A similar muscle to the biceps brachii in the upper arm and also double-headed. Two synergistic muscles are associated with the biceps femoris, the semitendinosus and the semimembranosus. Actions: Extends and laterally rotates at the hip, main action is flexing of the lower leg at the knee. Popliteus: The popliteus is located behind the knee joint and acts to “unlock” the knee by rotating the femur on the tibia allowing for the lower leg to be flexed. Attachments: Originates from the posterior of the tibia and attaches to the femur. Actions: Laterally rotates the femur on the tibia “unlocking” the knee joint so that flexion can occur. Extension: Produced by the sartorius and quadriceps femoris group of muscles. Flexion: Produced by the biceps femoris, semitendinosus, and semimembranosus muscles. The popliteus muscle facilitates this movement by unlocking the fully extended knee joint. Rotation: The knee joint allows for slight rotation when flexed, which is produced by the biceps femoris, semitendinosus, semimembranosus, gracilis, and sartorius. Muscles of the leg insert into ankle and foot bones to facilitate ankle movement. The ankle consists of two joints which permit dorsiflexion, plantarflexion, inversion, and eversion of the foot. Strong ligaments hold the ankle joint in place, although it is susceptible to damage. Muscles controlling movement at the ankle are found in the leg and can be split into anterior, posterior, and lateral compartments. plantarflexion: Movement of the foot downwards away from the lower leg. eversion: Tilting of the foot so the sole faces away from the midline. inversion: Tilting of the foot so the sole faces into the midline. dorsiflexion: Movement of the foot upwards towards the lower leg. Movement at the ankle is controlled by two joints. The ankle or talocrural joint is formed from the tibia and fibula of the lower leg and talus of the foot. Functionally, it acts as a hinge, allowing dorsiflexion (pulling the foot upwards towards the lower leg) and plantarflexion (pulling the foot downwards away from the lower leg). Eversion (tilting of the sole of the foot away from the midline) and inversion (tilting of the sole of the foot inwards towards the midline) is controlled by the subtalar joint formed between the talus and calcaneus bones of the foot. The ankle joint is held in place by numerous strong ligaments that can be easily damaged when excessive force is placed on the ankle, particularly during strenuous inversion and eversion. Movement at the ankle is key for maintenance of posture and balance, but is most important in locomotion. Variation in muscle activation can control the movement of the ankle joint, allowing the foot to generate graduated force. Muscles that generate movement at the ankle are generally found in the lower leg and can be split into three categories. (a) Anterior Compartment of the Leg and (b) Posterior Compartment of the leg: Anterior view of leg showing the muscles and tendons involved in ankle movement. : Posterior view of leg showing muscles and tendons involved in ankle movement. Three muscles in the anterior compartment of the leg act to dorsiflex and invert the foot at the ankle joint. Tibialis Anterior: The tibialis anterior muscle is located alongside the lateral surface of the tibia and is the strongest dorsiflexor of the foot. Attachments: Originates from the lateral surface of the tibia and attaches to the base of the big toe. Actions: Dorsiflexion and inversion of the foot. Extensor Digitorum Longus: The extensor digitorum longus is a deep-lying extrinsic muscle that runs the length of the tibia. Attachments: Originates from the tibia and transitions into a tendon, passes into the foot, splits into four, and attaches to the toes. Actions: Extension of the toes and dorsiflexion of the foot. Extensor Hallucis Longus: The extensor hallucis longus is a deep lying extrinsic muscle beneath the extensor digitorum longus. Attachments: Originates from the fibula and attaches to the big toe. Actions: Extension of the big toe, and dorsiflexion of the foot. Several muscles are located in the posterior compartment of the leg, typically grouped into superficial and basal groups. The majority of these muscles work to plantarflex the foot at the ankle. The superficial muscles give rise to the characteristic shape of the lower leg. Gastrocnemius: The gastrocnemius, a two-headed muscle, is the most superficial of the muscles in the posterior compartment. Attachments: Both heads originate from the femur. The fibers converge to form the calcaneal tendon which attaches to the heel. Actions: Plantarflexes the foot, can also flex the lower leg at the knee but is not key in this movement. Plantaris: The plantaris is a small muscle lying between the gastrocnemius and soleus. It is absent in 10% of people. Attachments: Originates from the femur and attaches to the heel via the calcaneal tendon. Soleus: The soleus is a large flat muscle which is the deepest lying of the superficial muscles. Attachments: Originates from the tibia and fibula and attaches to the heel via the calcaneal tendon. Tibialis Posterior: The tibialis posterior is the deepest lying of the muscles in the posterior compartment. Attachments: Originates from the tibia and fibula and attaches to the plantar surfaces of the toes. Actions: Inverts and plantarflexes the foot, maintains the arch of the foot. Two muscles found in the lateral compartment function to control eversion of the foot. Physiologically, there is a preference for the foot to invert, so these muscles also prevent excessive inversion. Fibularis Longus: The fibularis longus is the longer and more superficial of the two muscles. Attachments: Originates from the fibula and tibia. The fibers converge into a tendon which passes under the foot and attaches to the medial side of the foot. Actions: Eversion and plantarflexion of the foot. Fibularis Brevis: The fibularis brevis muscles is the deeper and shorter of the two muscles. Attachments: Originates from the lateral surface of the fibula and attaches to the little toe. Actions: Eversion of the foot. Eversion of the Foot (tilting of the sole of the foot away from the midline): Performed by the fibularis brevis and fibularis longus. Inversion of the Foot (tilting of the sole of the foot inwards towards the midline): Performed by the tibialis posterior and tibialis anterior. Dorsiflexion of the Foot (pulling the foot upwards towards the leg): Performed by the tibialis anterior, extensor hallucis longus and extensor digitorum longus. Plantarflexion of the Foot (pulling the foot downwards away from the lower leg): Performed by the gastrocnemius, plantaris, soleus and fibularis longus. Movement of the foot and toes requires the action of many muscles. The hallux or large toe is extended by the extensor hallucis brevis on the top of the foot. The flexor hallucis brevis and abductor hallucis flex and abduct the big toe. The adductor hallucis adducts the big toe. The remaining toes are flexed by the flexor digitorum longus, lumbricals, flexor digitorum brevis, and quadratus plantae. The little toe is also controlled by the flexor digiti minimi and abductor digiti minimi. The toes (other than the big toe) are extended by the extensor digitorum brevis. The dorsal and plantar interossei are muscles between the metatarsals that help maintain the foot’s arch. The also aid in flexion and extension. plantar: The sole of the foot. dorsal: The top surface of foot. The foot plays a fundamental role in maintaining upright walking posture and balance, so it must provide a strong base while allowing for small, accurate movements. The foot can be split into dorsal and plantar compartments, the latter of which contains significantly more muscles. Although many extrinsic muscles attach within the dorsal compartment, there are only three intrinsic muscles which act on the foot and two extrinsic muscles which act on the foot rather than the ankle. Extensor Digitorum Longus: The extensor digitorum longus is a deep-lying extrinsic muscle that lies runs down the length of the tibia. Actions: Extension of the toes. Extensor Digitorum Brevis: The extensor digitorum brevis muscle is a deep-lying intrinsic muscle lying beneath the tendon of the extensor digitorum longus. Attachments: Originates from the heel and attaches to the toes. Extensor Hallucis Longus: The extensor hallucis longus is a deep-lying extrinsic muscle lying beneath the extensor digitorum longus. Actions: Extension of the big toe. Extensor Hallucis Brevis: The extensor hallucis brevis muscle is an intrinsic muscle of the foot lying between the extensor digitorum longus and lateral to extensor hallucis longus. Attachments: Originates from the heel and attaches to the big toe. Dorsal Interossei: There are four dorsal interossei located between the metatarsals. Each arises from two metatarsals. Attachments: Originates from the sides of metatarsals one to five (big toe to little toe). The first muscle attaches to the medial side of the phalanx of the second toe. The second to fourth interossei attach to the lateral sides of the phalanxes of toes two to four. Actions: Abduct and flexes digits two to four. The muscles of the plantar compartment play a key role in stabilizing the arch of the foot and controlling the digits, providing the necessary strength and fine movements to maintain balance and posture and promote walking. Plantar View of Foot: The muscles, tendons, and ligaments of the sole of the foot with flexor digitorum brevis shown in red. Abductor Hallucis: The abductor hallucis muscle is located on the medial side of the sole. Attachments: Originates from the heel and attaches to the base of the big toe. Actions: Abducts and flexes the big toe. Flexor Digitorum Brevis: The flexor digitorum brevis muscle is located laterally to the abductor hallucis and lies in the middle of the sole of the foot. Attachments: Originates from the heel and attaches to all the toes excluding the little toe. Actions: Flexes the toes at the proximal interphalangeal (between the phalanges preoxmales and phalanges mediae) joints. Abductor Digiti Minimi: The abductor digiti minimi muscle is located on the lateral side of the foot. Attachments: Originates from the heel and attaches to the little toe. Actions: Abducts and flexes the little toe. Quadratus Plantae: The quadratus plantae muscle is located superior to the flexor digitorum longus tendons. Attachments: Originates from the heel and attaches to the tendons of flexor digitorum longus. Actions: Assists flexor digitorum longus in flexing the lateral four toes. Lumbricals: The lumbricals are four small skeletal muscles, accessory to the tendons of the flexor digitorum longus and numbered from the medial side of the foot. Attachments: Originates from the tendons of flexor digitorum longus. Attaches to the toes. Actions: Flexes at the metatarsophalangeal (between the metatarsals and phalanges proximale) joints, while extending the interphalangeal joints (between the phalanges proximale and phalanges mediae). Flexor Hallucis Brevis: The flexor hallucis brevis muscle is located on the medial side of the foot. Attachments: Originates from the plantar surfaces of the cuboid and lateral cuneiform bones in the sole of the foot and attaches to the big toe. Actions: Flexes the big toe. Adductor Hallucis: The adductor hallucis muscle is located laterally to the flexor hallucis brevis. Attachments: The adductor hallucis originates from the bases of the first four metatarsals, and also from the plantar ligaments before attaching to the big toe. Actions: Adduct the big toe and maintains the arch of the foot. Plantar Interossei: The three plantar interossei lie beneath rather than between the metatarsal bones. Each is connected with one metatarsal bone. Actions: Adducts and flexes digits three to five. Flexor Digiti Minimi Brevis: Similar to the interossei in structure, the flexor digiti minimi brevis muscle is located on the lateral side of the foot underneath the metatarsal of the little toe. Actions: Flexes the little toe.